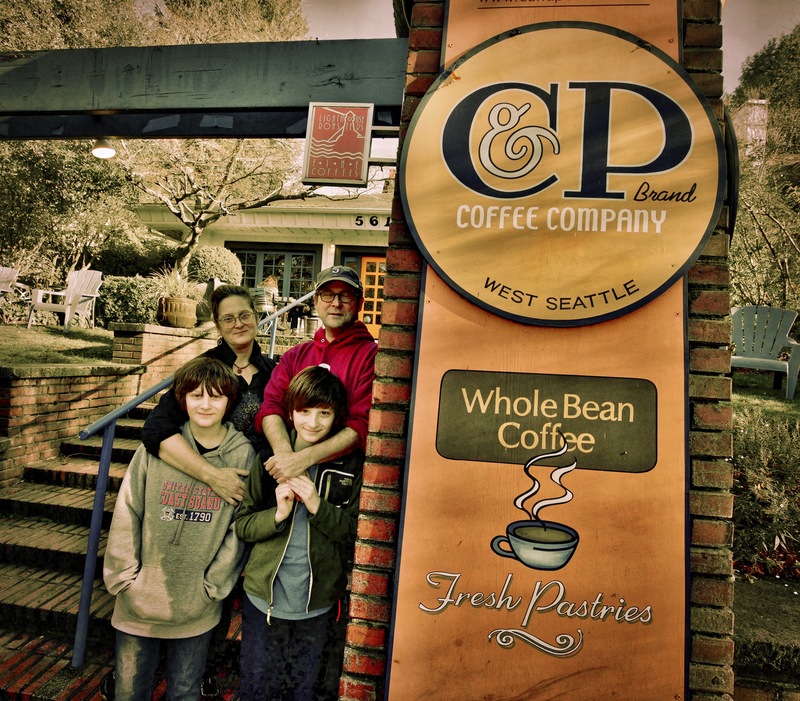 Cameron and Pete Moores (with sons Maddy and Ty) founded C & P Coffee fifteen years ago. Now the land and building are up for sale and the couple is urgently attempting to raise funds directly and through investors to preserve this beloved piece of West Seattle community. Like many things, the wish to know is greater than the ability talk about it but the future of the ownership of the building and land for C & P Coffee Company is still up in the air. "We are hammering away at it," Pete Moores said but because it's a process there is nothing more to be said. Except perhaps that the GoFundMe campaign has now reached $74,000 (with a goal of $240,000) and this experience has been for the Moores, literally life changing. "We didn't know before this came up what people felt about this place. We're just small business owners but people have been donating $5 or $100 or instead of one pound of coffee, they buy two or if they are thinking about a place to have a meeting they come here. I can't express how much this has meant to us." Many people have wondered if they are in their last days or if they are being forced to move but as we previously reported, they have two years left in their current lease in any event. So it would be awhile before any changes like that took place, should their plan to buy the land and building not come together. In the meantime it is business as usual at C & P and they have a full schedule of music all in place for many months ahead. The campaign to raise money to enable Pete and Cameron Moores to purchase the land and building for C & P Coffee Company has hit $61,900 as of Sunday January 28. The couple said they are attempting to raise $250,000 via their GoFundMe page and 517 people have responded to the call. They indicated others have expressed interest in backing them to help them reach their goal too. With the first right of refusal on the property, if they have the funds they are hoping to be in a position to make an offer on the property which has been put on the market at 1.2 million. The wave of development in West Seattle and the proximity of the shop to the C Line Metro Bus stop makes it potentially valuable to a developer. The couple said their plan if successful is to keep the property much the same and operate it for at least another 10 years. C & P has become a community gathering place for meetings, music, art shows and classes and now is a symbol resistance to the changes West Seattle has seen happening with increasing speed. When they opened in C & P Coffee Company in a classic West Seattle rambler fifteen years ago Cameron and Pete Moores had no idea what it would become. Now their community business is threatened by the beast that is seemingly destroying much of what made West Seattle desirable in the first place, development. The property's owners, Jerry and Nancy Maples, who do not live in the area put the land and building up for sale last week seeking $1.2 million. The lot area is 7500 square feet and its 2018 appraised value is $750,000. It is located 5612 California Ave. SW. The classic house was valued at $1000 as it has been since 2001. C & P, say the Moores and as many who have come in to the shop in recent days will attest, has come to represent what West Seattle used to be. Over time by hosting music, art shows, classes, and countless meetings it has become far more than a coffee house. It is the kind of place that is quickly disappearing. Built in 1915 the house has been a home, an artist's gallery, a childcare center and more. As recently as 2009 the property was valued at $374,000. But the sale price is not something the Moore's could afford so an effort is being made for them to buy it, with help from the community. Since they made the announcement the outpouring of support for them has been overwhelming. People have walked in with checks of as much as $500 and the couple has set up a GoFundMe page seeking $240,000 and in a little more than a week the campaign has raised more than $54,000. "I'm really thirsty," Cameron said, "I've been crying tears of gratitude for the last few days." Cameron said, "I can't fault the landlord for wanting to sell her property. That's totally within her rights. We want an opportunity to play, that's all." The Moores have first right of refusal which means they can match any offer that comes up on the property within 15 business days but the window is very short, less than three weeks with the first ones likely to come by this Wednesday. "Hello friends, family and neighbors. A few weeks ago, our beloved and historic coffee house property that we have leased for 15 years was suddenly put on the open market—for $1.2 million! This place has become an center for our community and we are determined to save it. Which means putting in a bid to buy, and the asking price is beyond our means. If we are successful in our goal, Pete and I are dedicated and determined to giving back to this neighborhood that has so generously supported us. We are forever changed by your belief in us to be stewards of your second home. We want to continue doing what we do and share that journey with you." Beyond the GoFundMe effort the couple have been in touch with a few investors who have the wherewithal to help raise the necessary funds. They will likely need others but Pete said, "I believe we can make this thing happen. We are cautiously optimistic we can pull this thing off. It's a tall order to come up with that kind of money." The couple would go in with their investors to buy the land together then keep it basically as it is with the investors owning part of the property. "The window we've given our people is ten years, then we will figure out what the next step is." But as Cameron points out, "It's not only a real estate investment, it's an investment in the community. Obviously there's money involved but it's important to them to save these buildings. It's important to save places to be. That we save some part of the character of our neighborhood." "Every person that comes in has a different marker about what it means to them. This has been the coolest experience of my life because the business that I started is not the business that it has become," Cameron explained. The business, if the effort to buy it is unsuccessful, would not move immediately in any case. They have a two year lease. But they can't see themselves working somewhere else. "I don't want to be doing this in a box somewhere else," Cameron said, "This place has character." "The community made this place what it is," said Pete. "When we opened the doors we were starting a coffeeshop. It became a community coffeehouse by virtue of the fact that all these people coming through the doors have taken it. They made it theirs and obviously they feel ownership of the place because of the response that we've gotten. There's a feeling in there, a vibe you don't get in a normal coffeeshop, and people feel that. The amount of support has been humbling to say the least." What they are trying to do is to get support from a few people "of means who care enough about the place, but not only this place. There seems to be a tangible reaction from people who don't want to see another box. There would be another box here, which is very distasteful to people," Pete said in reference to a very common apartment building trend in West Seattle in the last five years. If they are successful in beating out other bids, they would most likely keep it very close to as it is. "It's the coffeehouse and we won't mess with it because it's obviously successful in its own right. People care about this place in a way you're not getting when you sit in a Starbucks." West Seattle has for its entire history, been a place with its own identity, almost seceding from the city more than once. But it's sleepy small town feel has changed with the press of the housing shortage, the arrival of big corporate interest and the skyrocketing property values. Some efforts to preserve what it was have gained notice from the Alki Homestead's ongoing restoration to the new Landmark status of the Hamm Building in the West Seattle Junction. But holding on to the part of a community that really represents and actively preserves the quality of life here sometimes requires a lot more effort. "This kind of place can endure," said Pete, "If it's protected."